Street families, indigenous people and victims of disaster belonging to 203 families are the first batch of beneficiaries of the Modified Conditional Cash Transfer of the Department of Social Welfare and Development who received prepaid cards of the Land Bank of the Philippines. Through the prepaid cards, beneficiaries of MCCT may get their cash grants at any Automated Teller Machines or they can use it to purchase groceries or medicines through Point-of-Sale system. The first batch of 203 prepaid cards comprise the first tranche of more than 700 prepaid cards, which will be distributed in the future. 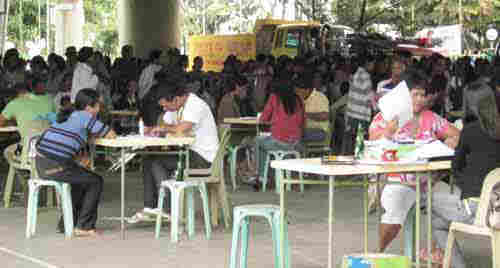 The application of additional 1,400 MCCT beneficiaries is currently being processed. The prepaid card features account information and identification picture of individual beneficiaries. This will prevent selling and pawning of cards and will provide further security to the owner of the card. The initiative to convert MCCT payments to prepaid cards is aligned with the United Stated Agency for International Development (USAID)/E-PESO’s objective to advance financial inclusion by facilitating the rapid adoption of electronic payment use. MCCT is an innovation of the Pantawid Pamilyang Pilipino Program (4Ps) that provides cash grants and social welfare assistance to families not covered by the regular 4Ps program, specifically the street dwellers, indigenous people, and victims of disasters. To date, there are more than 200,000 households enrolled in the MCCT nationwide including more than 2,000 street families in the National Capital Region. This entry was posted in NEWS, POVERTY and tagged Land Bank, Pantawid Pamilyang Pilipino Project, Public Finance, Social Welfare and Development. Bookmark the permalink. The poverty “alleviation” program that benefits not only the poor but some others’ pockets. When cash was doled out directly to beneficiaries by LandBank, a new scheme will surface soon on how it is being abused.